Is this a Colorado Gwindel? 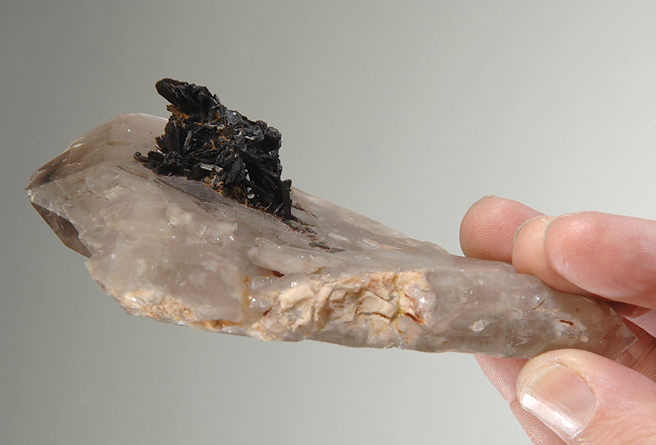 A radiating ball of goethite crystals sits on a single flattened quartz crystal composed of several parellel growths that have a pronounced twist . The form is "gwindel like" but as the back side is less twisted I am not certain if this can be classified as one. I have asked some quartz experts and they are divided mostly because the crystal tappers to a wedge like form and is thus not fully typical. Whatever it can be classified as, it is unusual and a Colorado classic locality piece. This was broken and repaired many years ago (it was in a collection by the 1930's) and it is visible on both sides (more so in the back). There is some chipping and damage to the geothites, but it overall is in good condition. A very attractive and unusual crystalized smithsonite from this great American Classic locality. There is a rich crust showing discrete, rounded individual crystals with top quality color and luster on the gossan matrix. Good "wet" look to the crystals and a fine value for this very collectable locality. This is not the usual massive material and different from the "rice grain" type crystals. The mines of Madan have produce some wonderful and unique Galenas, this is one. 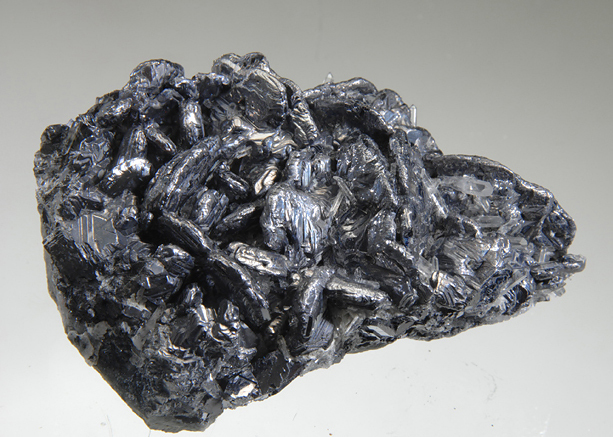 The flattened spinel twins have been "melted" by later hydrothermal fluids and show several complex forms much like a jumble of flattened discoidal plates. The crystals reach 3 CM. This piece has a bright mirror like luster and is in perfect condition (except chips on one part of the outer edge where it was collected, and that is not easily seen) all the display face is undamaged and showey. I have enjoyed searching out some of the special Galenas from Madan this is a fine and different example. 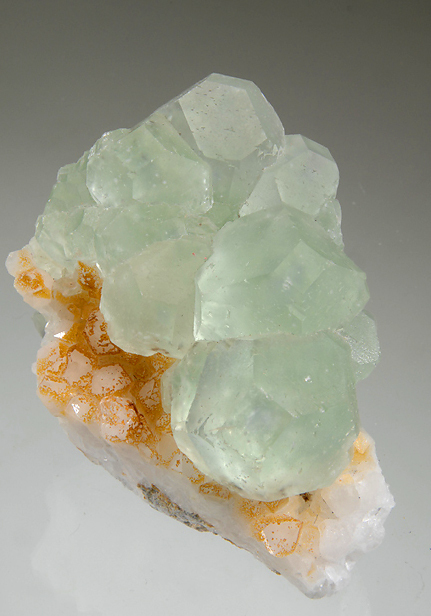 The last thing the world needs is more green Fluorite from China, unless it is REALLY different! This is a different and interesting example of modified cubes that more like like material from Naica and older Dalngorsk than China, they have the sharp and clear window face and are sizable at 3.4 CM. Nice mint green color and luster with color contrast on the matrix. Over all quite esthetic, tho there is noticable damage on the perifery it still displays well. 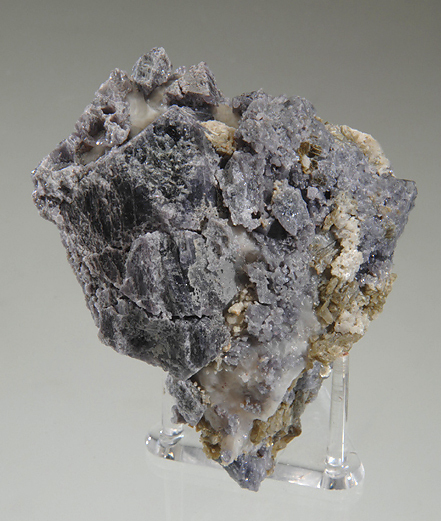 A good addition for a Fluorite suite, or a China collection as this is not typical! 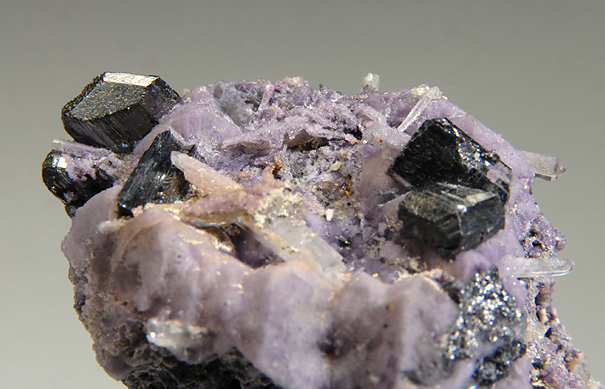 Bournonite on Fluorite with Quartz, Boulangerite etc. A wonderful esthetic for a dark mineral like Bournonite is to be displayed on on colorful matix, and this piece does that well. Several sharp, prismatic and lustrous silvery crystals of Bournonite are well placed on a sparkling purple fluorite and quartz mixture. 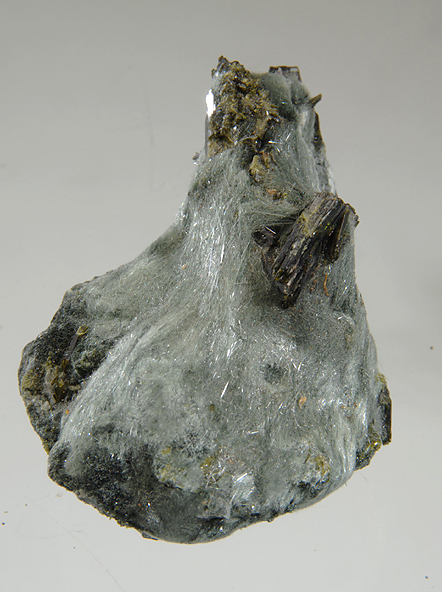 A few matted hairs of Boulangerite are in evidence as well. There is one Bournonite that is broken off (not very distracting tho) all the rest are quite clean by eye and only show some edge chips at 10X magnification. A very good matrix Yaoganxian piece and a good value. From the historic and most highly regarded locality for Epidote this is a good example of the byssolite association and an inexpensive way to own a true classic! The Epidotes reach 1.5 CM set on a sparkling mound of Byssolite fibers. 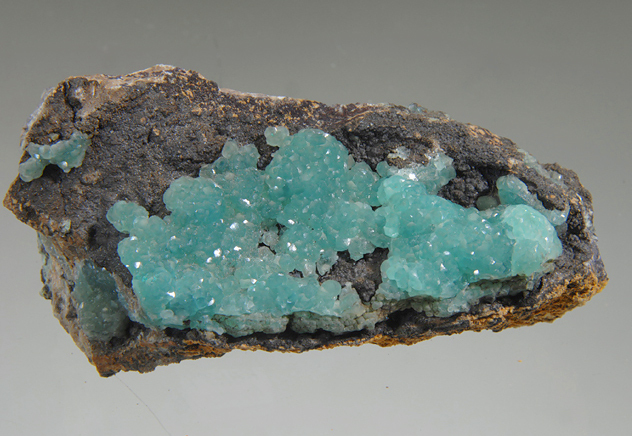 There is damage on the epidotes, they are not the gemmy crystals this locale is known for, but the Byssolite is very attractive. This piece is from a 1930's vintage collection and is very reasonably priced. A fine, old, lusterous and esthetic pyro from one of the most classic locations of all, Bad Ems. This is also a classic form as it shows the stacked chain like growth of the individual crystals that flare to form a tree like structure. Good rich orange to dark salmon color and minimal damage that is clearly not distracting. These have been increasing in price and some quite damaged examples are currently on offer for far more than this piece.